Looking to dine out in South Delhi? We’ve listed a few of our go-to places for different cuisines, just to make it a bit simpler for you. This Pan-Asian paradise is hands down one of our favourite places to grab some excellent sushi. 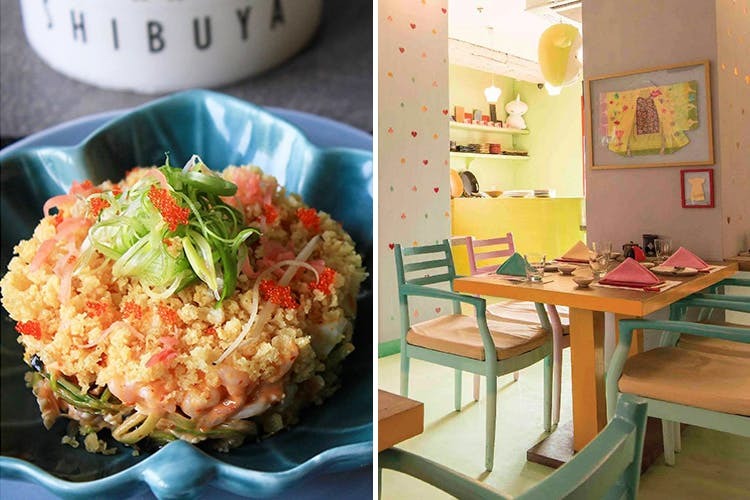 But look beyond the spicy tuna roll and you’ll see their avocado salad, kimchi pot and Japanese pizza - just the things you'll find yourself coming back for. Guppy is a pretty little place, perfect for a sweet dinner date. They have the nicest poke bowls, Belgian pork belly and the Goychu, both prawn and mushroom, are great. We love the boozy Sunday brunch here, too. A newbie in GK 2, the cherry blossoms on the ceiling and fantastic cocktails will leave you mesmerised. They’re doing a little bit of everything but we’re loving the Japanese food here. The mushroom and bacon fried rice, salmon red curry ceviche and braised pork ramen should be on your list. They seriously know their way around an authentic Italian meal. A little on the expensive side, we recommend you go for the Capelleti in Brodo (ricotta filled pasta pockets in a clear broth), Piadina e Crescione (spinach stuffed flatbread, served with slivers of meat, cheese and pickled vegetables) and Tomino (grilled Camembert with mushroom bruschetta in truffle oil). Another pretty little place, the food here is beyond your usual pizza and pasta. Try the beetroot carpaccio, Calamari Fritti or the Scallopine di Pollo (pan-seared chicken in a delicious butter and lemon sauce). Sorrento is fancy, and does authentic Italian. Go for the Black Cod with roasted forest mushroom, Caprese salad, and Chicken Sous Vide with macaroni ziti. The pastas and pizzas are divine, so if you want to stick with the basics – not a bad idea. They have great food and you have to try their special paan dessert. Gulnar tikka (malai paneer with figs and walnuts), Galauti ki Kismet (meat lovers, you’ll be fooled by their minced mushroom—this is almost like meat) and the Tulsi tangri kebab (pesto-rubbed and deliciously-prepared chicken legs) are a few things to try here. They have a vast menu to explore on an empty stomach. Go and try their galauti kabab, Awadhi kebabs, curries and their aromatic biryani. Wrap up your meal with the Narangi Kulfi, served inside a fresh orange. They take fine-dining to another level, and this place is definitely going to cost you a bomb. But if you go here, try the famous namesake ‘Daal Bukhara’, tandoori prawns and Sikanderi Raan (this is a marinated whole leg of lamb, so go in a group). We love the brand, and the cafe is just as fantastic. They do amazing cocktails, but the food here really steals the show. Start with the Original Baja Californian Fish Tacos, and then order a good amount of appam and dig into their Masala Fish curry and Garam lamb curry. It’s a pretty place in Adchini that does amazing coastal food. Try the Mimosa Muthaiy, devilled eggs with the most delicious stuffing served with prawns on top and the dig into the chicken chettinad curry, served with Malabar paranthas. All these will have you licking your fingers. The fried fish, vegetable stew, malabar parathas are fantastic, but their crab masala is a winner. Try the chicken ghee roast with paper-thin neer dosas and you’ll be in a food coma. Thank us later. We love the margaritas, but let’s talk about food here. Try the chipotle pizza, bacon ranch quesadilla and vegetarian tacos. Definitely our favourites.